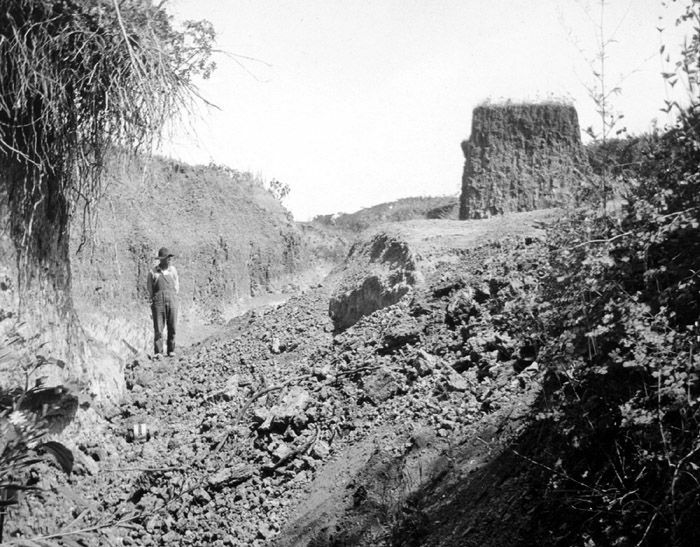 A flash flood in 1908 exposed this the archaeological site near Folsom, New Mexico. The site was named for the nearby town of Folsom. Shortly after the flood if 1908, George McJunkin, an African American cowboy, amateur archaeologist and historian, who was working as a foreman on the Thomas Owens Pitchfork Ranch, discovered remains of a giant prehistoric bison in Wild Horse Arroyo about eight miles west of Folsom. Though it would be years before the site was excavated, when it finally was, archaeologists found 32 skeletons and at least 26 spear points, now known as “Folsom Points”. This discovery changed the thinking in the world of archaeology, pushing the presence of man in North America back by at least 5,000 years to 12,000 years. The site was declared a National Historic Landmark in 1961. Slowly, most of the homesteaders gave up as the weather turned drier. The remaining farmers accumulated the abandoned land into larger plots. However, as the area continued to suffer from drought, most of the farming holdouts gave up as well. Cattle and sheep ranchers bought up the farmlands that eventually returned to pasture. A high school operated briefly in Folsom, but it only graduated three students in 1931. Folsom’s elementary school closed in 1958, at which time the students were transferred to Des Moines, New Mexico. The school still stands and is used today for community events. By 1960, Folsom was called home to 142 people. The Doherty General Merchandise Store, built in 1896, stayed open until 1959. 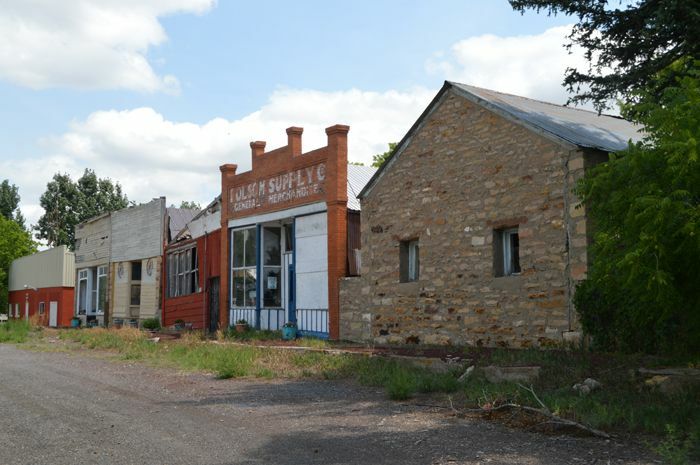 Now a semi ghost town, Folsom is a pleasant ranching community, called home to about 60 people and several historic buildings. The old 1888 railroad station was moved from the right-of-way around 1970 and is now used as a storage building and next to it, on the corner is the old Texaco gas station which was built sometime before 1946. Across the street is the Doherty Mercantile building, which became the Folsom Museum in 1966. 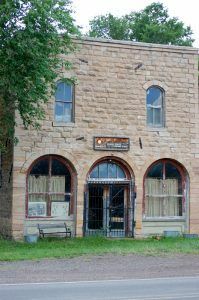 The abandoned stone two-story Folsom Hotel still stands on the south side of Main Street along with several false-front stores. The old Folsom Hotel by Dave Alexander, 2018. On the north side of Main Street, is an active post office. St. Joseph’s Church continues to provide services at 118 N. 2nd Street and a cemetery is situated east of the church. 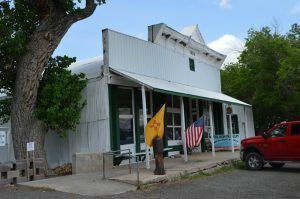 Folsom is located 36 miles east of Raton on New Mexico Highway 72. The Capulin Volcano National Monument, rising to an elevation of 8,182 feet, is located seven miles southwest of Folsom on New Mexico Highway 325. The Dry Cimarron Scenic Byway continues north from Folsom on New Mexico Highway 456. 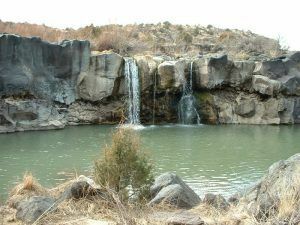 Folsom Falls, New Mexico, courtesy Wikipedia. About 3.5 miles northwest of Folsom, is the site of Folsom Falls, a natural spring-fed waterfall, which long served as a favorite fishing hole and picnic grounds for area residents. Unfortunately, it sits on private land behind a gate and the public is no longer allowed to visit today. About eight miles north of Folsom, Highway 456 intersects with Highway 551. North on 551 is Toll-Gate Canyon where Charles Goodnight trailed many herds of cattle from Texas to Wyoming from 1866 to 1869. Between 1871 and 1873, Bazil Metcalf constructed a toll road from the Dry Cimarron through Tollgate Gap, providing one of the few reliable wagon roads between Colorado and New Mexico. This road remained an important commercial route until the Colorado and Southern Railway came through in the 1880s. Folsom Museum by Kathy Weiser-Alexander, 2018.